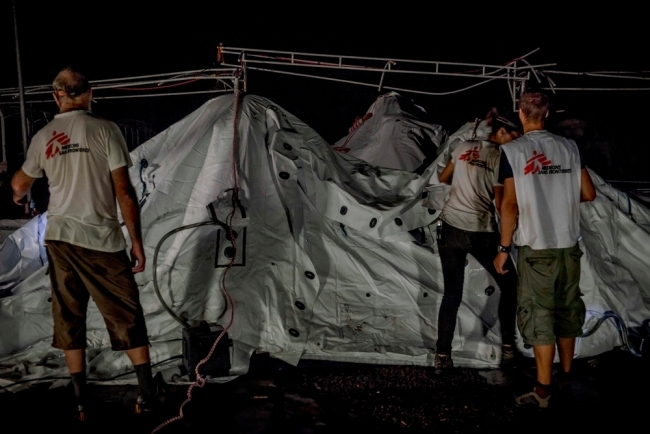 Our team of six scouts in Tacloban were responsible for setting up a base and identifying a relevant intervention strategy for MSF within a few days. After three challenging nights, we had selected Bethany as a site to re-establish a referral hospital for the entire Tacloban region, which was one of the most affected. We were housed on the three top floors of the city’s highest building. Not the most luxurious or the most convenient since it meant we have to climb the equivalent of one Empire State building every day according to the number of stairs. Contrary to what I have been reading in the native regional press, bless their souls, we didn’t requisition the hotel but managed quicker than others to get in touch with its owner, who had fled to Manila, and asked for his authorisation to occupy the place. Likewise, the fact that we’ve hired the kitchen crew of a renowned tourist hotel really doesn’t mean that we are fine dining every day, far from it. There are now thirty hungry mouths to feed and, despite their established skills, our cooks have to do like the rest of us: they work with what they can find. Markets are slowly reopening though; street stalls offer fresh fish again. Small jovial local restaurants feed a few starving international volunteers, most of them oblivious of the irony of the situation. 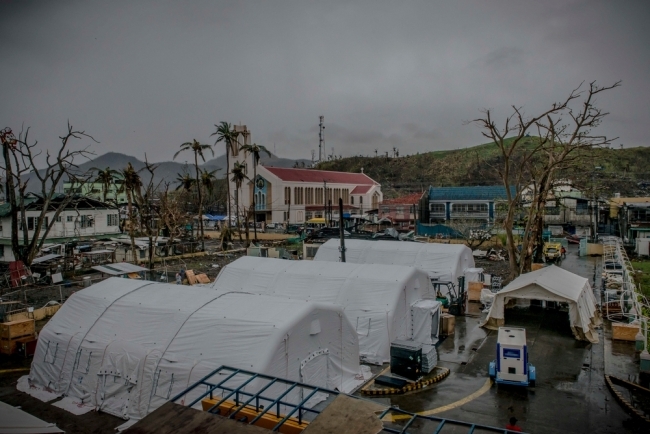 Meanwhile in Cebu… Frustrations that had been building up with the difficulties in transporting our inflatable hospital to Tacloban have finally dissipated. After a week which took care of the little hair we all had left, a boat was eventually found to carry our precious shipment. MSF supply managers barely escaped a nervous breakdown last week. We don’t waste another minute. Without even talking about it, the team decides to work to death until our star hospital is finally ready to play its role. This is one of those epic nights that have built the legend of MSF emergency teams as well as eternal friendships based on a common thirst for adrenaline. It’s difficult to share with those who weren’t there, such as the journalists for example, who stayed put in their comfortable hotels. Result: A fully functional 50-bed general hospital in which our doctors can finally treat people. 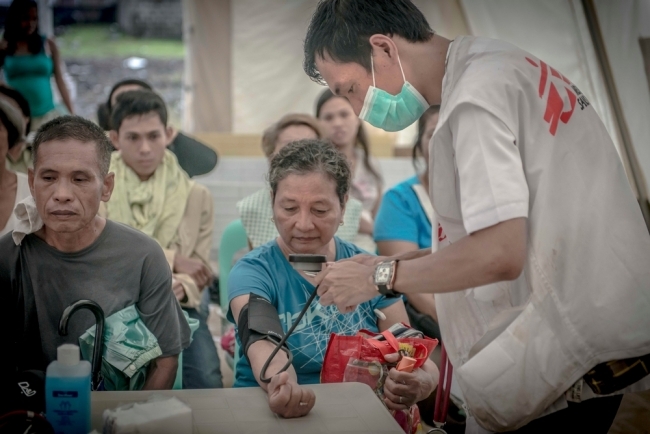 This is why most of the first MSF staff to reach the field are generally not practicians but experienced logisticians and experts in water/sanitation/mechanics/biomedicine/human resources/accounting. Without any shelter, food, electricity, transport, money, staff, medicines, equipment, facilities, hygiene, water, and toilets… a doctor could as well finish you off. Few public hospitals in Tacloban have resumed their activities, and electricity remains the main issue. Without it, there is no cold chain, no blood bank, no vaccines, no sterilisation, no lab. When Daniel, our generator whisperer, went to fix Palo Health Department’s generator, he probably saved more lives that day than any surgeon we could have sent. The priority is now to staff the hospital with Filipino medical staff as quickly as possible, ideally those who used to work in the hospital. A massive international MSF tribe (more than 200 volunteers across the whole Visaya archipelago) was sent here because there is no choice if we want to act fast. The objective is now for each of them to handover their work to their local counterparts so as to facilitate our eventual departure. At this point, precipitation gave rise to another star: Elizabeth, our HR – and hence recruitment – officer. A Filipino TV crew was on site at the hospital to interview us on the situation. I took this opportunity to ask Elizabeth to pass the message that we were looking for medical staff, doctors, midwives, nurses, psychologists…. She played her part with such enthusiasm that she gave her mobile number on national TV without being absolutely clear on the fact that we were most of all looking for recruits originally from Tacloban, who had been evacuated just before or right after the Typhoon. Her voicemail lasted a few hours before literally exploding, some people even calling from the United States to offer their services. Surprisingly, no marriage proposal to report…yet. Anyway, the response we got in less than 24 hours measured up to our expectations, our needs and the Filipino solidarity. Other high value human resources left us last Saturday: the French Humanitarian Fire Brigade from Lyon and Saint-Etienne, who, when they were not tearing each other to pieces over soccer discussions, were instrumental in setting up our gem of a hospital. Securing the building, disposing of the waste, evacuating dead bodies, all those tasks would have hindered our work had they not been here with us. They were rock stars to us. Perhaps now the girls will deign to look at the rest of us guys who don’t wear a uniform? Dream on… their replacement team has just arrived to extend the intervention by one week!